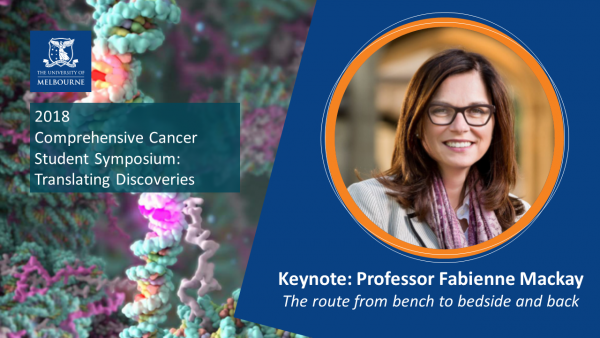 This symposium aims to highlight the exciting research of young scientists from the Comprehensive Cancer PhD program, across many different scientific disciplines who are aiming to progress our understanding and treatment of cancer together. Addressing this year's theme 'Translating Discoveries', the topic of Professor Mackay's keynote speech will be The route from bench to bedside and back. Professor Mackay obtained her PhD from Louis Pasteur University in Strasbourg, France. As the Head of the School of Biomedical Sciences, she is internationally recognised as a leader in the field of B cell Immunology, Autoimmunity, and Cytokines. Professor Mackay's group is focusing on inhibitors for the BAFF receptor TACI to treat Systemic Lupus Erythematosus (SLE) and Chronic Lymphocytic Leukaemia (CLL) without compromising key immune function and, therefore, an approach that has a better safety profile. Her research and teaching directly influence clinical practice and she continues to make internationally significant contributions to the field of autoimmunity and oncology, with a strong record of knowledge translation and community engagement.